Our ministry continues to knit and crochet numerous shawls for the sick members of our parish, our community, and any other individual for whom a shawl is requested. We have provided shawls to not only individuals from multiple religions and states, our shawls have reached other counties as well! We were even blessed to offer a prayer shawl to the Pope! Recently someone in our ministry made a wedding caplet for a friend of hers. This Advent begins a new chapter, as we are making baptismal blankets to be given out to the newest members of our Parish here at Our Lady Queen of Peace. If you would like to request a prayer shawl for a sick member of your community, you may contact us with your request at psolqp@aol.com or call the Parish Center. Our shawls are made with love and prayers and blessed by our parish Priests. My name is Janice and I am very proud to a part of Our Lady Queen of Peace Parish Family. It was in the summer of 2006 when I saw the first Prayer Shawl being made by a family member who is very dear to me, Marie Herrick. I was and still am truly inspired with her explanation of the Prayer Shawl Ministry and its Vision. I knew then that this was a very special Ministry and I wanted to be a part of it in some way. The Vision is to combine the care and love of knitting and crocheting into a Prayerful Ministry that reaches out to those in need of comfort and solace. I finished my first Prayer Shawl on December 2006 and still remember the tears of joy in the woman’s eyes when I gave her the Shawl and Prayer Card. 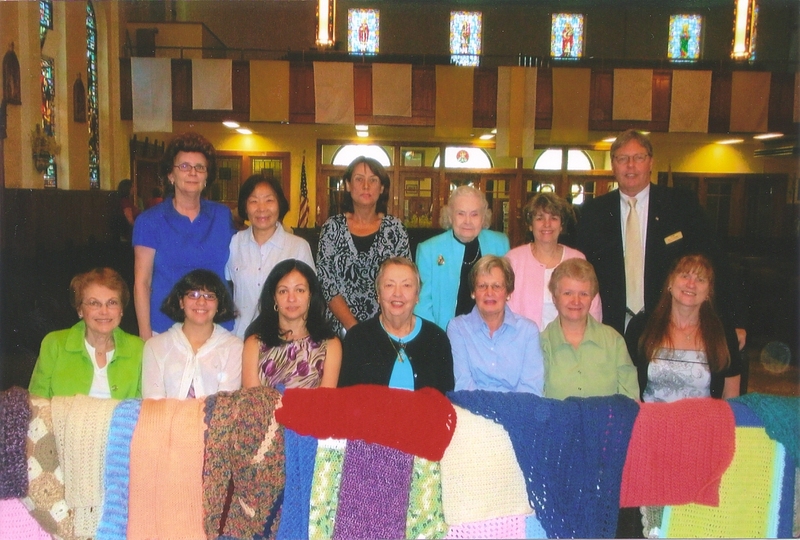 In October 23, 2008 with the Grace of God and the encouragement and support of our Pastor, Father Larry we had our first Prayer Shawl Meeting. I am happy to say that we have many members, some who attend the monthly meetings and others who make the shawls at home and bring them to Church for Blessing and delivery. As we enter our third year together I am so pleased to say that we have given out more than 200 shawls to the sick and homebound members and friends of our Parish Family. If you are adding someone to our sick list, please consider the healing power of these beautiful shawls when you call the Parish Center. God’s Hands are working through Our Prayer Shawl Ministry – Those who knit, crochet and receive these shawls are truly Loved and Blessed!